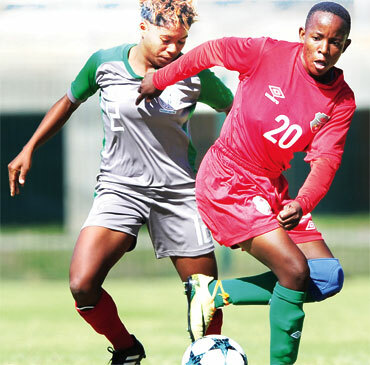 The Malawi women’s national football team revived its hopes of progressing to the knockout stage of the 2018 Cosafa Cup after beating Madagascar 2-0 at Isaac Wolfson Stadium in Port Elizabeth, South Africa, Friday. Relief was the prevalent emotion for Malawi after they started the campaign with a 2-0 loss to Botswana on Wednesday. The victory means Malawi have three points from two games. The She-Flames will meet hosts and defending champions South Africa in the last Group A match at the same venue on Monday. Overall group winners and the best runner-up will advance to the semifinals. South Africa and Botswana were in action yesterday as we went to press. Goals in each half from veteran striker Linda Kasenda and youthful attacker Zainab Kapanda were enough to guide the She-Flames to their first victory in this year’s tournament. Malawi coach Maggie Chombo- Sadik made three changes to the squad that lost 2-0 to Botswana in the opening game. Chombo-Sadik also changed the formation from 4-5-1 to 4-4-2. Veteran midfielder Bridget Mkuzilire, Ruth Nyirongo and Limbikani Chikupira paved way for Zainab Kapanda, Pilirani Malora and Shira Dimba, respectively. She-Flames started the game on a high pressurising Madagascar in search for an early goal but the Indian Ocean islanders were equal to the task. Unlike in the first game against Botswana where they looked lost and without a purpose, the She- Flames were a much improved side against Madagascar. Malawi went into the game hungry for goals but wasted several scoring opportunities in the opening minutes. It took 18 minutes for the She-Flames to find the back of the net through Kasenda. The Skippers FC striker tapped in from close range after Madagascar goalkeeper Verosantatra Diana fumbled Shira Dimba’s attempt. Dimba and Madina Ngulube were Malawi’s best players in the first half. However, Malawi sat too deep after the goal and invited pressure as Madagascar attacked wave after wave. Veronique Rina and Genevieve Razafindramidina caused plenty of problems to Malawi‘s defenders. The wood work came to the She-Flames’ rescue on two occasions as Madagascar continued to pile pressure but Malawi held on until half time. Madagascar came into the second half a changed side after the introduction of Aimmee Christina who dictated matters in the midfield. But it was Malawi who scored through Kapanda with ten minutes to full time to end the game in their favour. “I am happy because there was a fighting spirit among the players. We just need to keep working hard and hope that we beat South Africa in the last game so that we progress to the knock out stage,’’ she said. Madagascar coach Hortesia Namihasina rued the missed chances. “My players were tired after playing against South Africa on Wednesday. We were also wasteful in front of goal,” Namihasina said. At the same stagein Bulawayo, Zimbabwe last year, Malawi defeated Madagascar 6-3 but failed to go past the group stage. Malawi– Martha Banda, Fatsireni Kazembe, Maureen Phiri, Salome Vinkhumbo, Pilirani Malora, Dimba, Kapanda, Ngulube, Kasenda, Emmily Jossam, Fanny Mwale. Madagascar -Verosantatra Diana, Mamy Lalaina, Razafindrimidina, Veronique, Marrie Sara, Hanitriniana Nivonirina, Noriarity Nirina, Julie Razanarisoa Solonilaina, Anajrasoa Velomanantsolo, Andonoaniaina Rasamison, Irlac Ramanantenasoa.